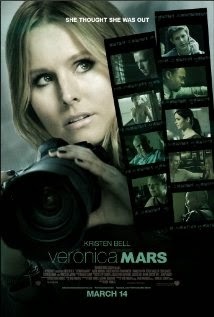 Veronica Mars (2014) is the new movie spinoff of a television series you probably never saw. It exists because of a successful Kickstarter campaign which managed to raise around $6 million, a solid monetary foundation for a movie but a very small percentage of the average Hollywood movie budget (less than 10%). But while supporting low budget filmmaking is important, that's not why you should see this modest little movie about a girl with a camera instead of that new one with Liam Neeson punching people. You should see Veronica Mars because it actually has something to say about justice. You see, justice is an important thing that most people probably want, but how you go about seeking it is important because it doesn't take much to turn justice into its opposite. This dilemma is at the center of a lot of the controversy surrounding US politics over the last decade: NSA spying, remote drone executions, even the Patriot Act were all attempts by the government to maintain a sense of justice which got out of hand and lost sight of its core principles. The problem with justice is that those who seek it tend to become paranoid, overzealous, or both. But the state isn't the only entity capable of overrunning its boundaries into the realm of persecution. The law may often be an insufficient condition to bring about justice, but the vigilantes which rise from its ashes are just as dangerous. This is a conflict played out across a wide variety of movie genres. Revenge movies like Ridley Scott's Gladiator examine and question the lengths we go to in our pursuit of justice against the law. Detective mysteries like Curtis Hanson's L.A. Confidential investigate how corruption can come from within the law's own sense of justice. Superhero movies like Christopher Nolan's The Dark Knight analyze how a symbol of justice must be kept apart from the law. And here Veronica Mars takes up this illustrious tradition and provides new insight into it. So let's get into the plot (don't worry if you haven't seen it yet, no spoilers). Veronica Mars is a recent college graduate looking for a job as a lawyer. When she hears a report that one of her friends from high school was convicted of murder, she returns to her home town of Neptune to help him find adequate legal representation. But the harder she looks into the case and the longer she stays in Neptune, the more she finds herself incapable of leaving well enough alone. In her voice over, Mars repeatedly compares her drive for detective work to an addiction. Once she gets a taste of it again she can't get enough. She sacrifices her relationship with her boyfriend as well as a perfectly decent (if relentlessly capitalist) job offer in her pursuit of vigilante justice. Repeatedly throughout the movie she puts her social life on the line in order to get to the truth. Like Sherlock Holmes, Veronica Mars is a detective with an addiction; she's a tainted heroine, a symbol that justice is never quite as pure as it wants to be. The problem of vigilantes like Veronica Mars, what makes them so compellingly troubled, is that without the impersonal, objective ideal of the law, justice can become pathological. The law has its own problems, but the hero who stands outside the law always runs the risk of losing sight of their ideals and making judgments based on self interest. In order to truly aspire to the good we must understand that justice is always already tainted, whether by pathological self interest or the unsympathetic disinterestedness of the law. The good always contains elements of evil. "The properly human good, the good elevated above the natural good, the infinite spiritual good, is ultimately the mask of evil." (p. 56). This is why cowboys always have to ride off into the sunset. It's why Sanjuro must leave town at the end of Yojimbo and why Batman has to leave on his motorcycle at the end of The Dark Knight. The conditions for justice have been established, but the hero broke the law and cannot be included in the new order. Vigilantism is a form of villainy and doesn't belong in the order it inaugurates, but at the same time it is necessary and good in that it provides more freedom than the law can allow and thereby checks the insufficiencies of the law. This is why Veronica Mars can't join the police force even after purging it of its demons. She can only work with her father's private investigation agency because her vigilante justice doesn't fit within the law. She is a force of good, but her brand of goodness is in a sense too evil to fit within the very law that it serves to cleanse. This is the role that her addiction plays. Understanding her drive for justice as an addiction is her "mask of evil": it is the drive which pushes her towards the truth but also the reason her form of justice doesn't fit within the system it creates. The good that Veronica Mars has to offer is beyond the law. So should you go see it? As far as its technical quality is concerned, I found it quite enjoyable. Occasionally you can feel the budgetary constraints and I imagine fans of the show will probably get more out of it than newcomers, but even despite all that it managed to be a fun character-driven thriller. Personally I haven't seen any of the show and I found it very accessible and easy to get into emotionally. I would definitely recommend it to anyone who likes detective movies and especially to anyone who likes movies about women who aren't defined by the men around her.